"We committed in 2007 to employ strict sustainable-building practices for all of our new construction and renovation projects worldwide," said Don Callahan, Chief Administrative Officer and Chief Technology & Operations Officer for Citi. "We also have a goal to LEED certify 15% of our global real estate portfolio by 2015. These are just some of the ways we're working to be as environmentally responsible as possible." "Citi is a 200 year old company that continues to thrive because of its resourcefulness and willingness to lead in areas like environmental stewardship," said Rick Fedrizzi, President, CEO and Founding Chair, U.S. Green Building Council. "Citi has demonstrated a company-wide dedication to economic, environmental and human health by embedding LEED principles into its design and refurbishment process." Citi, which turned 200 years old on June 16th, was one of the first global financial services companies to publicly join the fight to slow climate change and reduce its energy dependence. Citi was a leader in the development of both the Equator Principles and the Carbon Principles, which established best practices for assessing and mitigating environmental, economic and social risks in project finance. "Through our sustainability efforts, we get the double benefit of helping the environment while reducing our corporate expenses," said John Killey, Citi Realty Services' Global Head of Building Operations. "We had a goal to reduce our greenhouse-gas emissions by 10% from 2005 levels by the end of last year, and our participation in the USGBC's programs helped us exceed that goal while cutting costs." 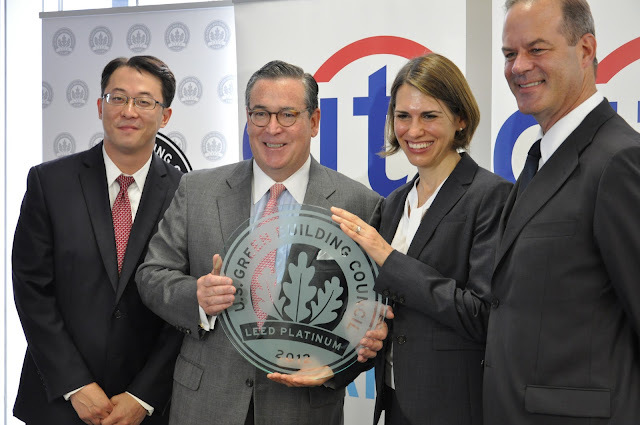 Citi expects to reach 263 LEED-certified projects by the end of 2012. Read about Citi's sustainability efforts in the 2011 Global Citizenship Report and at www.citigroup.com/citi/environment. This entry was cross-posted from the Citi Blog.